I couldn't get enough carrots in India. I loved the bright red carrots full of flavor. Earthy yet bright, sweet, crunchy, and cool. I would eat them as snacks in rickshaws and trains. The best carrots I tasted were in Rajasthan. I bought some good organic carrots in San Francisco that were grown in Bakersfeild, CA to make gajar ka halwa. Gajar ka halwa is an Indian dessert that, like many Indian desserts is based on the sacred ingredient, milk. 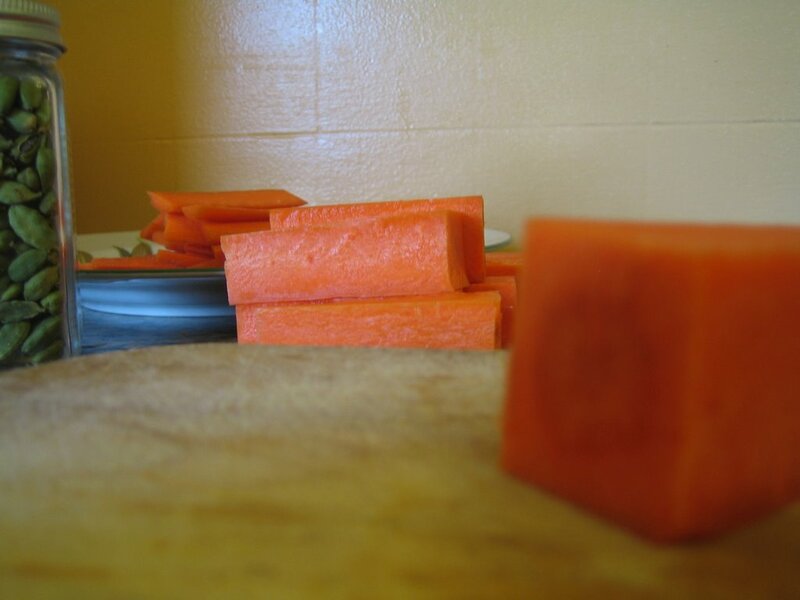 Cardamon is steeped in milk and the milk is reduced to a thick concentrated consistancy with carrots. The trick is getting the consistancy of the carrots right. They should not be mushy and they should not be raw. When undercooked, the water released from the carrots does not combine well with the reduced cream. When cooked just past al dente the carrot's juice combined with the thickened milk creates a natural sweetness and a smooth consistancy. Many cooks grate the carrots on a box grater, but I have found that taking the time to cut the carrots by hand to a thin julienne keeps the integrity of the carrots and assures even cooking. They are less likely to overcook and become mush when cut by hand. 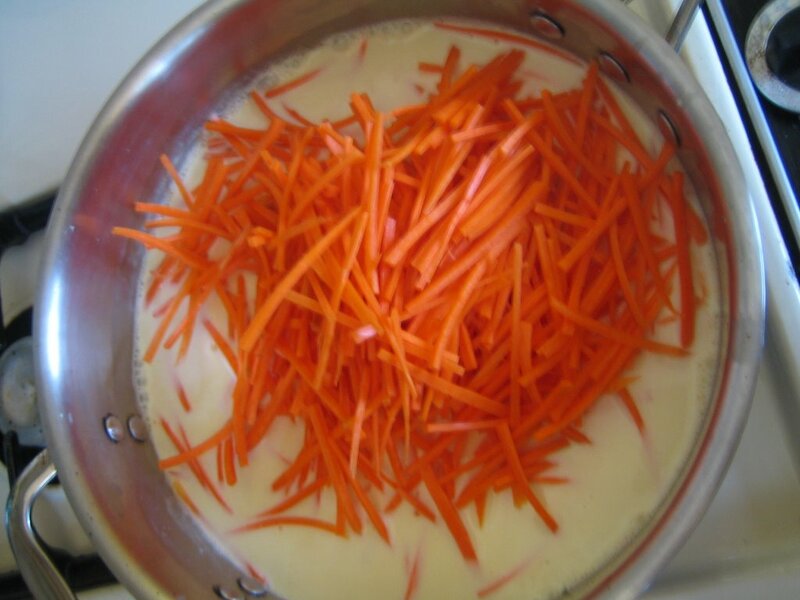 I add the carrots after a good half hour of slowly reducing the milk whith cardamom pods. 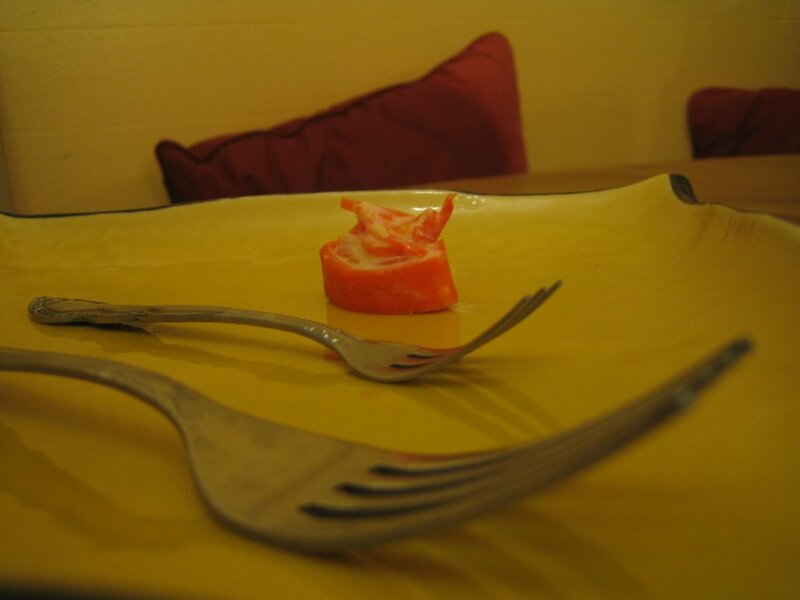 It is great to have the crunch of a raw carrot next to the velvet texture of Gajar ka halwa, so I have carved mini carrot boats to act as petit four cups to be filled with the finished gajar ka halwa. A fresh baby or young carrot would be nice to fill as well.